Intensive, selective, and challenging, our doctoral program is ideal for scholars intent on deepening and broadening their critical understanding of the law, as well as their original engagement with it. Our Doctor of Civil Law (DCL) program serves as a starting point for those planning to pursue careers in academia, think-tanks, government and international organizations, among others. Our students build the teaching supervision, leadership and knowledge that they need to take on any challenge. Whatever their ambitions, our students have great success in achieving them. The DCL program allows for the development of a substantial thesis, which makes an original contribution to legal scholarship. 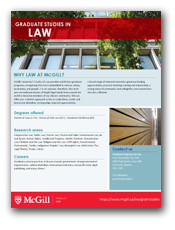 McGill's Faculty of Law currently hosts approximately 70 doctoral students, who come from all around the world. Each year, we admit roughly 15 new students to this vibrant community. or one of the Research Chairs at the Faculty of Law. Doctoral students at McGill’s Faculty of Law are invited to participate in Faculty Seminars and other workshops as a way to underscore their membership in a community of academic scholars.